Four safeties were taken in the 2018 NFL Draft before Justin Reid was selected by the Houston Texans with the 68th pick in the third round. Flash forward to Week 13, and Reid is coming off a 90.7 single-game grade and ranks seventh among all safeties in overall grade (80.3) on the year. The Stanford product has out-performed his draft position and on pace to finish as a top-10 safety in this league. Reid’s strength this season has been his tackling, as he’s registered 50 tackles and only three misses all season long — good for an 87.4 tackling grade that is seventh-best at his position. His tackling efficiency of 18.3 is also the ninth-best mark among qualifying safeties this season. 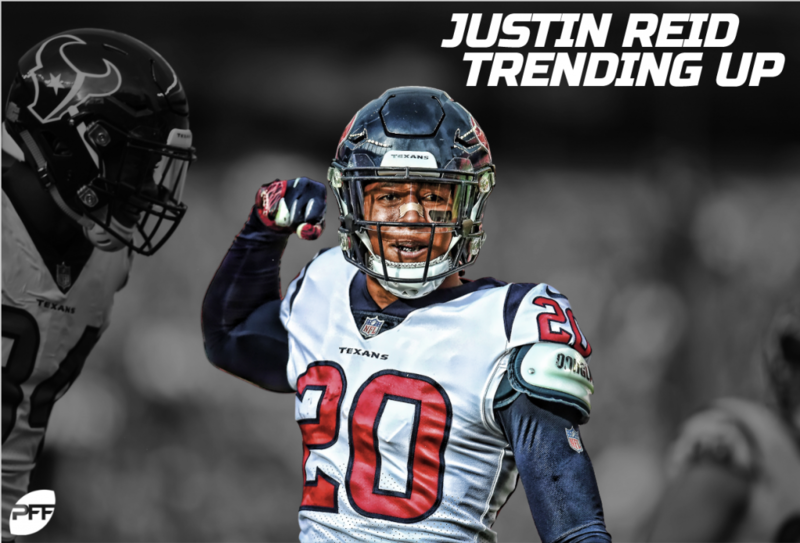 In addition to his high-end tackling ability, Reid has truly made his mark for the Texans’ defense when dropping into coverage, where he has generated an 81.1 grade on the season. He has allowed an average of 0.62 yards per coverage snap and 27.9 coverage snaps per reception allowed, the latter of ranking inside the top-20 among safeties. Limiting the big play has been a key component of Reid’s game, as well. He currently ranks fourth among safeties in forced incompletion percentage (36.4) on targets of 10-plus air yards this season. His 77.7 coverage grade on such plays also ranks second behind only Los Angeles Chargers rookie phenom Derwin James. Quietly, Reid has tied James in interceptions (3) and pass breakups (5) on 23 fewer targets. Reid has also tied Landon Collins for the most combined interceptions and pass breakups among rookie safeties in the last five years and still has four games to play. Reid’s playmaking ability and athleticism were on full display in the play below, where he snagged an errant throw in the end-zone and promptly outran the entire Washington Redskins‘ offense for the touchdown. Reid has been even more impressive over the second half of the season, playing not only like a top safety but also like a top defender. In Weeks 7-13, Reid has been exceptional, earning an 89.4 overall grade and 89.9 coverage grade, both of which are the third-best mark among qualifying safeties. He has been flying around the field and making plays, producing two interceptions (tied fourth among safeties) and four pass breakups (third) in that span, showing a penchant for turning bad throws into big plays. He is playing with comfortability and aggression, and he has refused to quit on plays, leading to highlights like the one below. Cleveland Browns’ Antonio Calloway breaks loose against the Texans and looks to be running for the easy score, but Reid accelerates downfield contacting Calloway and forcing the fumble just before he crosses the goal line to save the touchdown. His numbers across the second half of the season are even more impressive when looking at them compared to the rest of the rookie class, as his 89.4 overall grade in that span is the highest among rookie safeties and the second-highest among all rookie defenders. Not only that, but Reid’s overall grade in Weeks 7-13 ranks 18th among all defenders in the NFL. Reid has been outplaying his third-round draft position and many of the safeties taken in front of him. His performance this season has not been that of a third-round pick, but of a first-round talent.